Rafael Angelos just got handed the greatest gift any teenage boy could ever dream of. Upon arriving at his new boarding school for senior year, he discovered that he is the ONLY male student. But what should have been a godsend isn't exactly heaven on Earth. Raffi's about to learn that St. Mary's is actually a hub for demons-and that he was summoned to the school by someone expecting him to save the day. Raffi knows he's no angel-but it's pretty hard to deny that there's some higher plan at work when he wakes up one morning to discover a glowing circle around his head. Helen Keeble's debut novel, Fang Girl, has been praised for its pitch-perfect teen voice, and VOYA called it "refreshing and reminiscent of Louise Rennison's Confessions of Georgia Nicolson series." 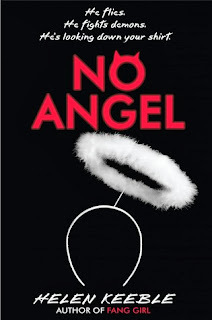 No Angel brings you angels and demons like you've never seen them-complete with the wry humor of Vladimir Tod, sinfully irreverent romance, and some hilariously demonic teenage dilemmas. It's funny how St. Mary's is a demon hub because I went to a St. Mary's back in gradeschool and let's just say I had the most unpleasant childhood experiences there. Rafael Angelos, or Raffi as he likes to be called, enrolls in an exclusive school for girls. What he originally thought would be a good idea quickly turned into a bad one upon finding out that he's the first and the only boy in the school. This put him in plenty of uncomfortable and inconvenient situations. The headmistress, as well as the rest of the faculty, kept an eye on Raffi twenty-four seven. Special classes designed for young women had to be modified to accommodate him. And let's not forget all the attention he got from all the other students who were just so happy to have a guy in school. Okay, well, that situation wasn't really inconvenient for Raffi. Uncomfortable at times, yes, but definitely not inconvenient. Raffi easily adjusted to all the female attention once he saw the perks of being the only boy in school. Raffi then meets three girls who are essential to the story: Faith, Krystal, and Michaela. Initially, Raffi was all about getting the girl. He was so caught up between the beautiful Faith and the enigma that is Michaela. Soon enough, with the help of geeky Krystal, he learns that there's more to his being in St. Mary's. I'm not quite familiar with angel mythology so I have zero complaints about Keeble's image of angels. I think the way the hierarchy of angels as well as their characteristics and appearances was explained well. You just have to keep up with the story because Raffi transforms all throughout. It takes a while for him to see which type of angel he really is. Every time Raffi becomes some sort of deformed creature after doing a good deed, I couldn't help but laugh at how funny his reactions were. He definitely freaked out a lot. The angel theme was entertaining enough but I found the humor my favorite thing about the book. I like how Keeble used the somewhat silly humor to give the whole angels vs. demon plot a lighter feel. Now the plot twists are both bad and good in my opinion. I liked that the story kept me guessing. Nobody is really who they are in this book. It got frustrating at some point though because it got kind of confusing. Not to worry though because the story ties up nicely in the end. My only complaint is the pacing. The beginning was rather slow and it wasn't that engaging. I also didn't like it much when the characters (especially, Raffi, because he's the only clueless one) got so fixated in the tiniest details. It kind of contributed to the slow pacing. However once the story picks up, it becomes a rather enjoyable read. Light, funny, and a good take on angel stories - 3 stars! Good review. Thanks for sharing your thoughts.